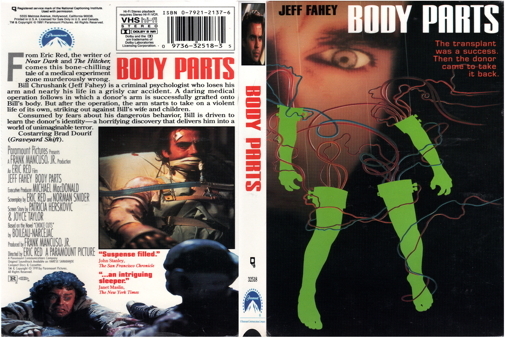 When prison psychiatrist Bill Chrushank (Jeff Fahey) loses an arm in a car accident, he receives a revolutionary new transplant from an unknown donor, who is later discovered to have been a recently-executed psycho-killer. During his recovery, Bill is tormented by violent nightmares and aggressive new impulses -- and his limb seems to have developed a malevolent will of its own, acting independently and lashing out beyond his control. He eventually discovers that an artist named Remo Lacey (Brad Dourif) -- whose work is influenced by the same nightmares -- is the recipient of the killer's other arm. Before long, the same donor's legs turn up on yet another man, who harbors the same violent mood swings... and the inevitable "reunion" culminates in a violent, gory finale.